Galveston bayside beach house on West End, in Bay Harbor. Home is a 5 bedroom, 3 bath, sleeps 14, 6 blocks from the bay, 2 blocks from the beach, expansive balcony and courtyard. The name captures the essence of the home – The Beach, the Bay, the Breeze - no matter where you are, you will feel the breeze, open-concept living, kitchen and dining areas with large island that seats up to eight. The ground level offers a bunk room, bunk room en suite with shower, private master bedroom, and large master en suite bathroom with jetted tub. Detached game room comes fully equipped with a PlayStation 3, board games, and a chalkboard table for countless hours of fun for kids and grownups alike. The game room doubles as a bedroom with a queen futon. The fenced in courtyard has plenty of seating; a large table that seats ten, a bar, and a tiki table for catching up with friends and family under the stars and under the sun. Beyond the courtyard, you can enjoy a game of horseshoes or tetherball, and there’s plenty of room to play football. 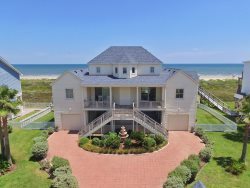 Whatever it is you like to do, this Galveston home has you covered, and we are sure it will have you wanting to come back - again and again. The Beach, the Bay, the Breeze is nestled in the quiet West End's Bay Harbor. Galveston Island offers world-class museums, entertainment, family fun, dining, shops, tours, amusement parks, golfing, fishing and swimming. Some of the most popular things to do on the island are visiting the shops on the Historic Strand and Postoffice streets, spending a day at the Historic Pleasure Pier amusement park, Schlitterbahn Waterpark and Moody Gardens aquarium, rainforest and so much more. Please check out Coastal Waves Vacation's Discover Galveston page for additional "Things to Do" and the island's full calendar of Events. View Galveston's 7-day weather forecast and average high and low temps for any month of the year. Summer is not the only time to visit the island - some people even prefer the fall & spring! Kitchen stocked with starter bags, 2 kitchen towels, roll of paper towel & dishwasher pods. Please contact us with any question or concerns PRIOR to booking. Most single-family homes on the beach are built on pilings. Guests must climb a full set of stairs to reach the first floor/main living area. Please contact us for properties with elevator access or bedrooms on the ground floor. Guest making reservations must be at least 25 years of age, responsible for completing and signing Rental Agreement, payments, checking in and occupying the property during rental period and be ultimately responsible for rental home & anyone they allow onto property. Check-in must occur in person at the Coastal Waves Vacations, LLC Office. No access is granted without the Rental Agreement being signed by both guest and company - even if paid in full. We require Guest's mailing address, names and ages of all individuals staying at the home, vehicle information, and full pet information for pet friendly homes. YOU WILL BE ASKED TO ACCEPT THIS RENTAL AGREEMENT DURING RESERVATION PROCESS (it will be available for viewing at this step). Please read it prior to proceeding with reservation. All Coastal Waves Vacations properties are non-smoking. Smoking is prohibited indoors or anywhere on the grounds of the property. All properties are self-serving. Linens are provided (bedding and 1 set of towels per person). Please bring your own beach/pool towels. One roll of tissue paper per bathroom, one roll of kitchen paper towels, starter trash bags, dishwasher and laundry pods are also provided. Top bunks are designed for children or petite adults. Coastal Waves Vacations requests that guests sleeping on top bunk beds not be over 150 pounds. If planning any special event, please contact our office and an agent will review any necessary policies with you. This property is not wheelchair accessible nor ADA compliant. Pet-friendly properties typically allow dogs only. Pets must be registered on Rental Agreement, and pet fee must be paid in advance. Prices and availability are real-time and can change without notice until reservation is confirmed. Coastal Waves Vacations reserves the right to collect an additional cash security deposit at time of check-in with 24 hours notice arrival date. Galveston Island offers world-class museums, entertainment, family fun, dining, shops, tours, amusement parks, golfing, fishing and swimming. Some of the most popular things to do on the island are visiting the shops on the Historic Strand and Post Office streets, spending a day at the Historic Pleasure Pier amusement park, Schlitterbahn Waterpark and Moody Gardens aquarium, rainforest and so much more.